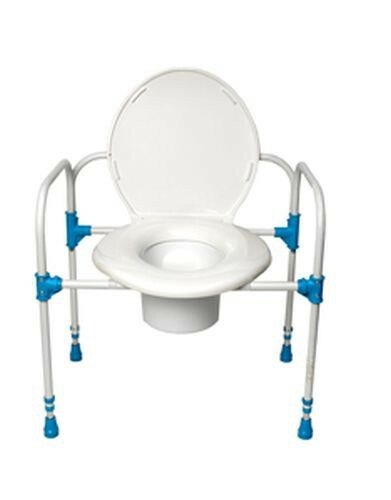 Big John Commode Chair by Big John Products is sturdy, adjustable toilet seat designed to provide comfort especially for elderly, physically challenged, bariatric, and surgical recovery patients. While perfectly suited to be used over toilets, providing added stability and an extra height boost, its unique design also makes it ideal for bedside use when a bathroom might be out of reach. No matter its placement, the Big John Commode Chair is sure to provide comfortable, pinch-free support that is stable and easy on the knees. 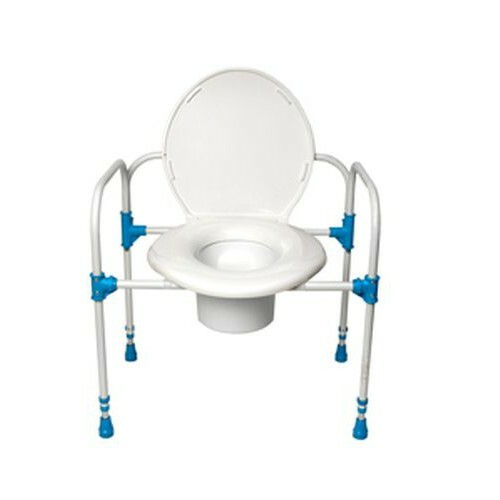 Big John Commode Chair features an adjustable height from 19 to 23 inches, ensuring an accommodating commode experience for the user. The Non-Slip Rubber Feet allow it stand firm on any surface, while the folding frame makes it is to take on-the-go. Vitality Medical also carries other top-selling Big John products such as the Big John Toilet Support and the Handheld Bidet. Provides Comfort Especially for Elderly, Physically Challenged, and Surgical Recovery Patients. Adjustable Height from 19 to 23 Inches. Stabilizing Handles for Easy Transfer. Folds for Easy Storage or Transport. Includes Sanitary Bucket Container and Big John Standard Toilet Seat.